I’m sending his book back. His comments about O’Donnell were the trigger. He made a major mistake, he took off his mask and let us see who he really represents behind the scenes, big government and washington as usual politics. This tea partier has no desire to go back to the glory days of Hastert, Tom Delay, Trent Lott, and a Bush that could never seem to find his veto pen to control his own party. 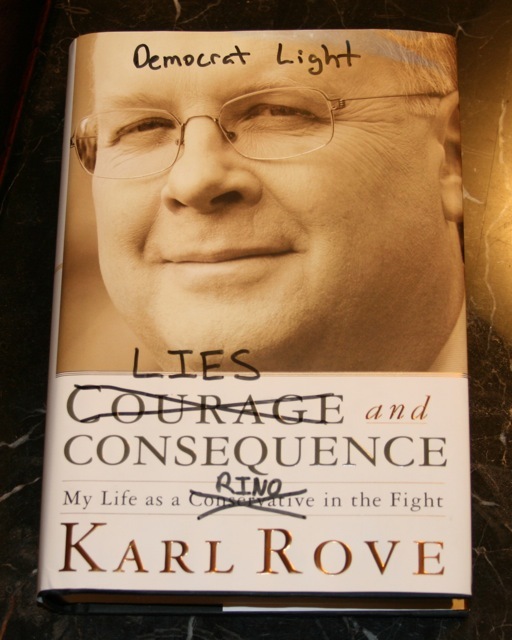 There has been some speculation that Rove is setting himself up as the bad guy in order to help fuel conservative voter outrage and assist getting people to the polls this November, which, if true, is bad strategy because it presupposes that voters aren’t already on their own merit sufficiently outraged. They’ve been doing just fine right now without the assistance of any political dark arts. The other alternative is that he is as beltway and blockheaded as they come and has effectively neutered for the future any credibility or influence he may possess. One is obviously less ridiculous than the other, but the more I hear him speak the more I wonder if there really is no spoon and it’s really the latter. This entry was posted in Election 2010, FAIL, gop, Mailbag, tea party by Dana Loesch. Bookmark the permalink.